Hop over to Andrea’s Bunny Hutch! Andrea loves looking after her furry friend Jazz. Help her to keep the bunny happy and healthy. Open the bunny hutch to take Andrea’s pet outside and play with it! Andrea keeps the bunny hutch shiny and clean with a bucket and broom. After playtime, make sure to give the bunny its favorite treats with the water bottle and a carrot from the garden! 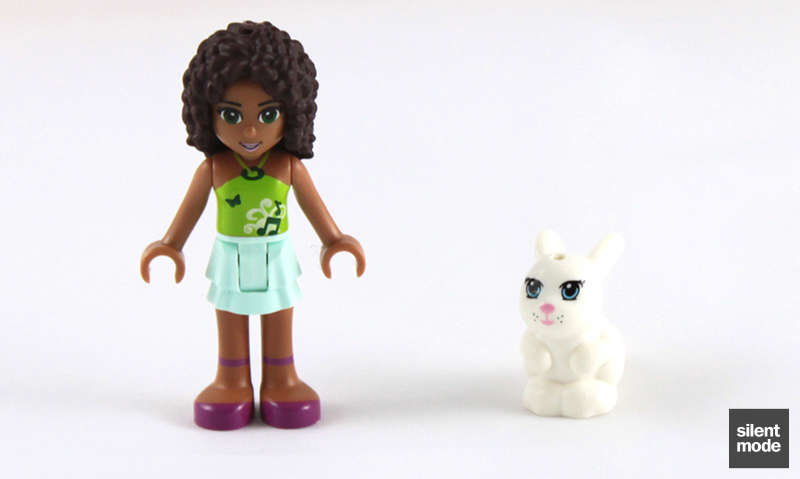 Includes bunny and Andrea mini-doll figure. I know what I thought of when I first heard this set was called Andrea’s Bunny House… but no, it’s actually a bunny house. 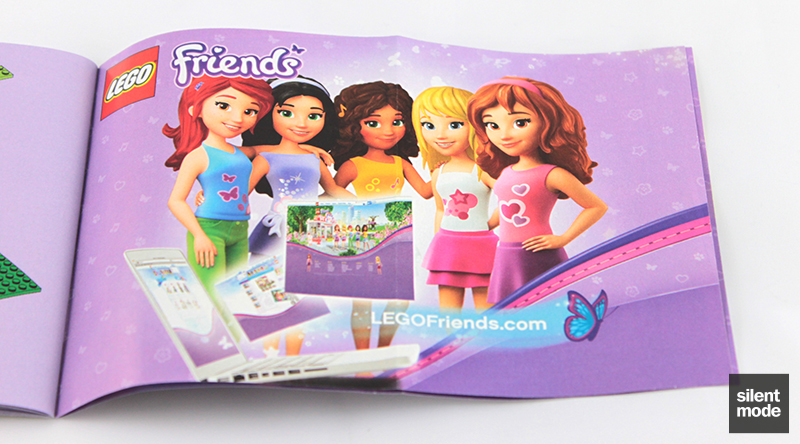 I’m not female, but I’ve been eager for the second wave of the Friends theme to see what else LEGO have got. The first wave proved to be very popular with the target audience, and from the models shown at this year’s The LEGO Show in Manchester it looks like the game has been upped. 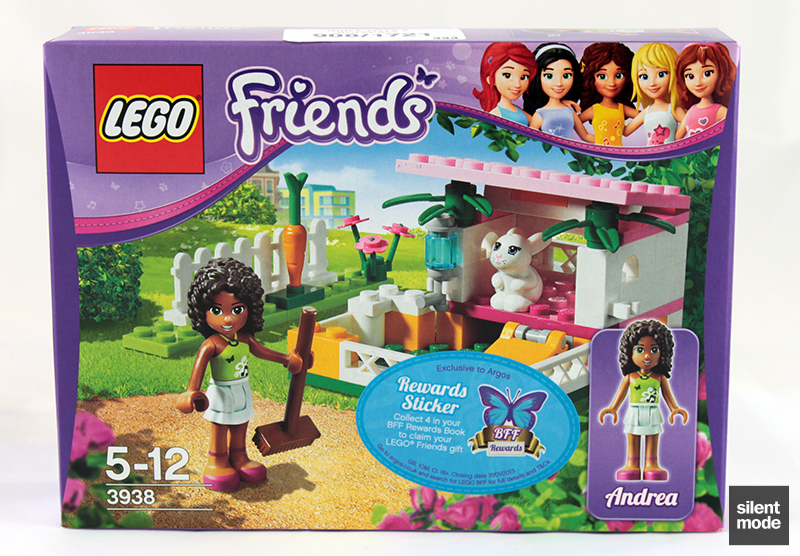 There seems to be a summer vacation theme going on with the second wave, and right now I’m going to take a look at one of the less expensive sets in the range. The box for Andrea’s Bunny House is roughly the same size as the similarly-priced sets in the first wave, and as things are taken outside this time the colours are a lot brighter and cheerful. You’ll be pleased to know that Argos’ BFF promotion is still on, with either this or this as a claimable gift. Today’s featured main character, if you haven’t guessed, is Andrea. While the other Friends have gone on different adventures, it looks like Andrea chose (or was perhaps forced) to spend time in the rabbit hutch. As usual the sides of the box are flat, but have the curved appearance of larger sets. 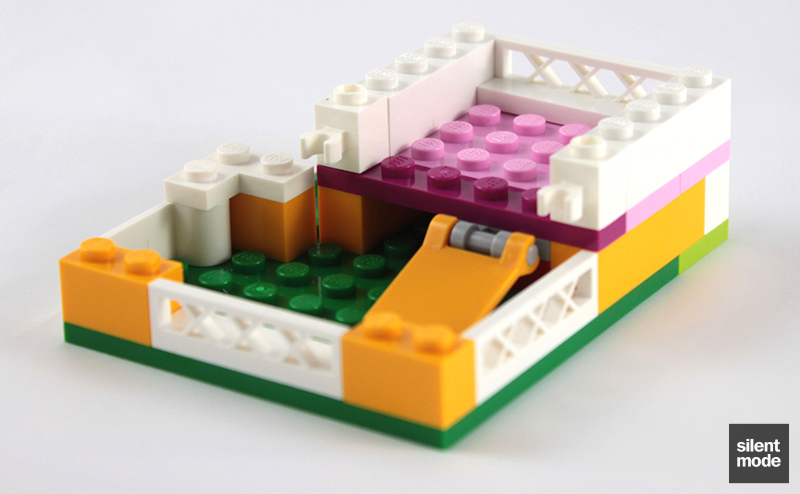 Following my eager question at this year’s AFOLcon: there was no scientific or research-based reason for the curved boxes, it was just something LEGO decided on to make the sets stand out. The usual warning on the side of the box in several different languages; no indication of where the parts were made, however. Note the spelling error on Argos’ white label. We welcome back the familiar configuration of two unnumbered bags, a large plate and the instructions folded in half. There wasn’t such a great need for padding this time, and on seeing the contents for the first time I thought just one bag would have been necessary: maybe a smaller bag inside a large bag for the small parts. You’ll be pleased to know that Andrea’s Bunny House is home to quite a few exclusive and elusive parts. This set offers just a small selection of plates and tiles in Bright Pink. 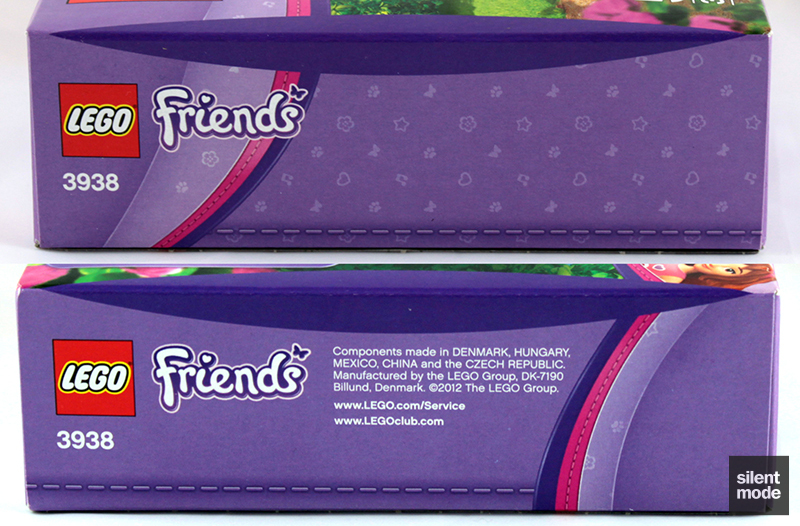 The 1 x 4 tiles are exclusive to the Friends theme, appearing in four sets so far. While the 1 x 6 plates in Magenta aren’t exclusive parts, their only other appearance was in a 2005 Belville Snow Queen set. Bright Light Orange is one of my favourite colours (re)introduced by the Friends theme. Again the 2 x 2 plates was last seen in Bright Light Orange in a 2005 Belville set, while all the other pieces are exclusive to this set. Let’s talk greens. This set is the by far the cheapest you’ll find that Green 8 x 8 plate in, while the 2 x 6 plates in Lime appear in three Friends sets and one Ninjago set. 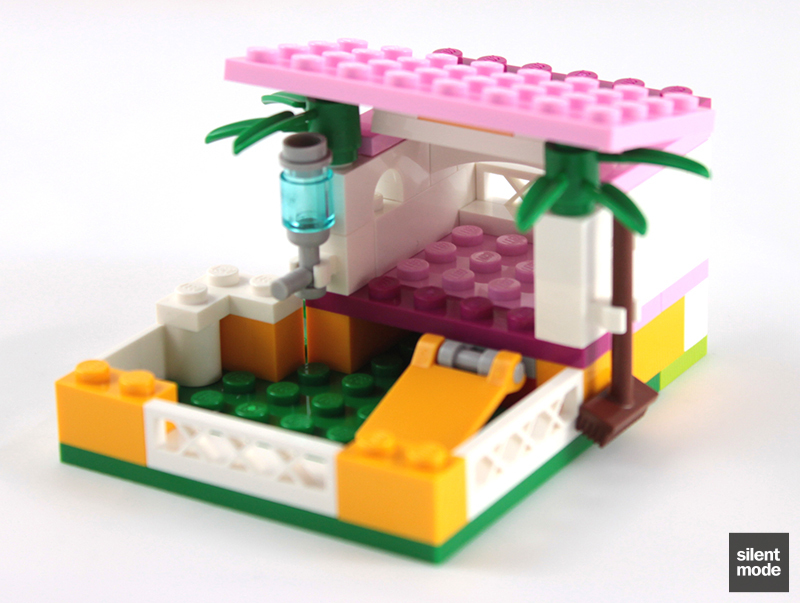 Along with the 1 x 4 Bright Pink tiles, this set shares the Lime 2 x 6s with Heartlake Vet and Heartlake Dog Show. Most of the parts in this set are white, and here we have a nice assortment of “architectural” pieces. 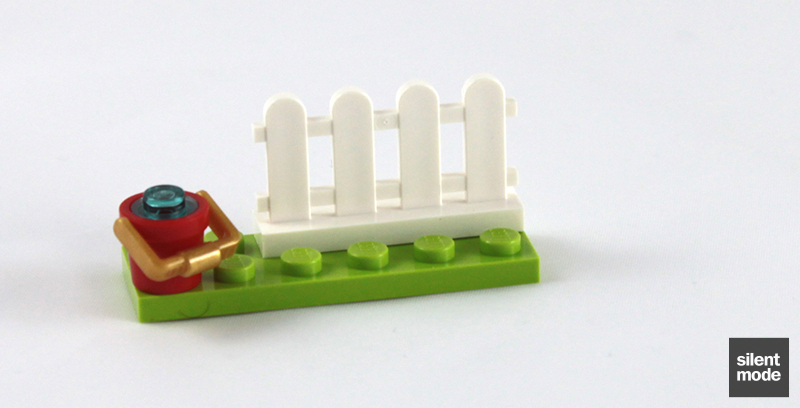 As the 1 x 4 picket fences had started appearing in PAB walls, they’re not as useful to find in a set as before. 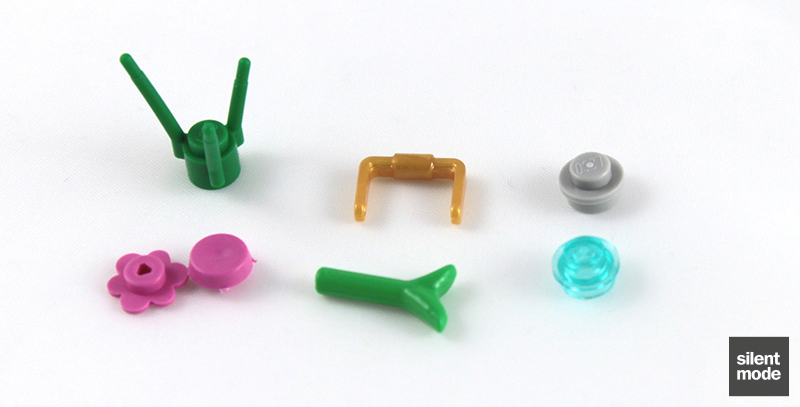 There are some other small pieces in the set, but these are the more interesting ones. That red bucket, which will probably be one of many hoarding pieces, only appears in three Friends sets right now. The Bright Light Orange parts can’t be missed, while everything else would be very useful for building a house or something. The Magenta plates didn’t make the cut only because there still aren’t that many parts in the colour yet, but they are ones to look out for. Please welcome back Andrea, who is sporting the same torso as in Andrea’s Stage and the legs from City Park Café. It seems that Andrea has gotten into the pet rearing thing too, as she’s looking after Daisy the bunny… except it isn’t Daisy, despite looking exactly the same. From the official description she’s named the bunny Jazz – perhaps a nod to Jazz Jackrabbit? or just the kind of music she likes? We were very sad to learn that Gewinne!th is no longer with us; she was snuffed out by these two no-names. Let’s have a moment of silence for Gewinne!th and that blood-chilling smile of doom. 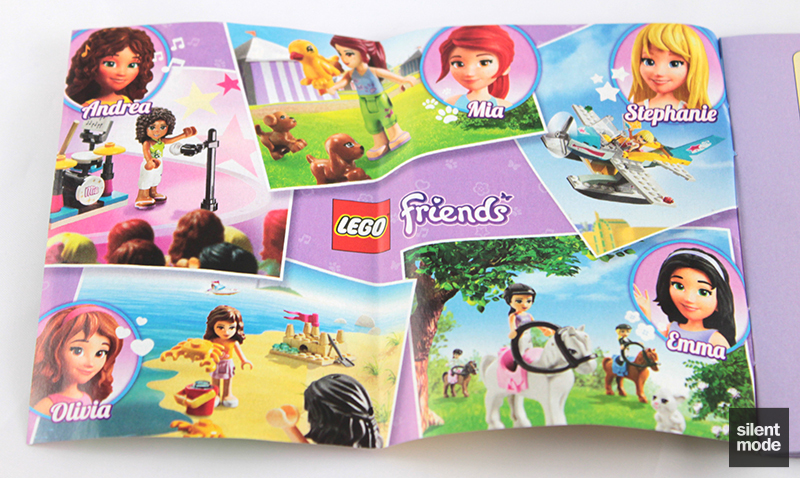 The inside front cover of the instructions shows the Friends doing what they do best: Andrea finally getting her shot on Figures Got Talent; Mia surrounded by stray animals; Stephanie successfully hot-wiring a plane; Emma learning how to ride; Olivia with crabs. 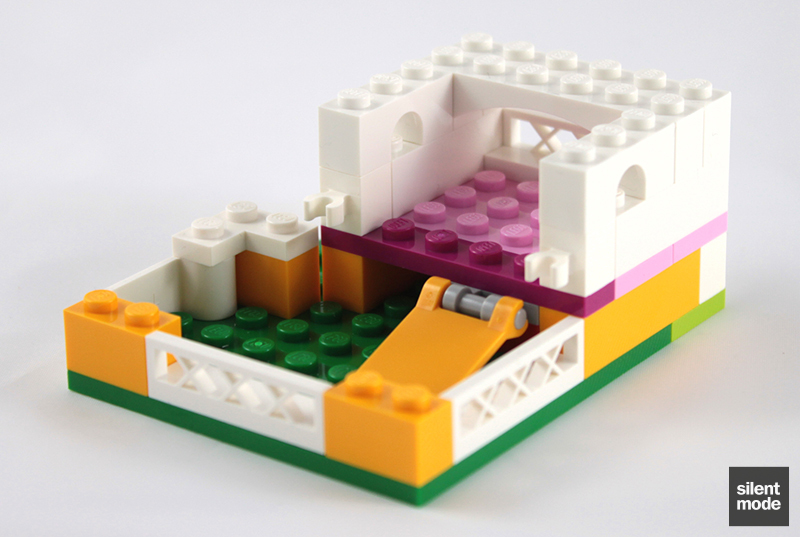 As hard as it is to believe with the small number of parts, Andrea’s Bunny House is divided into three builds. 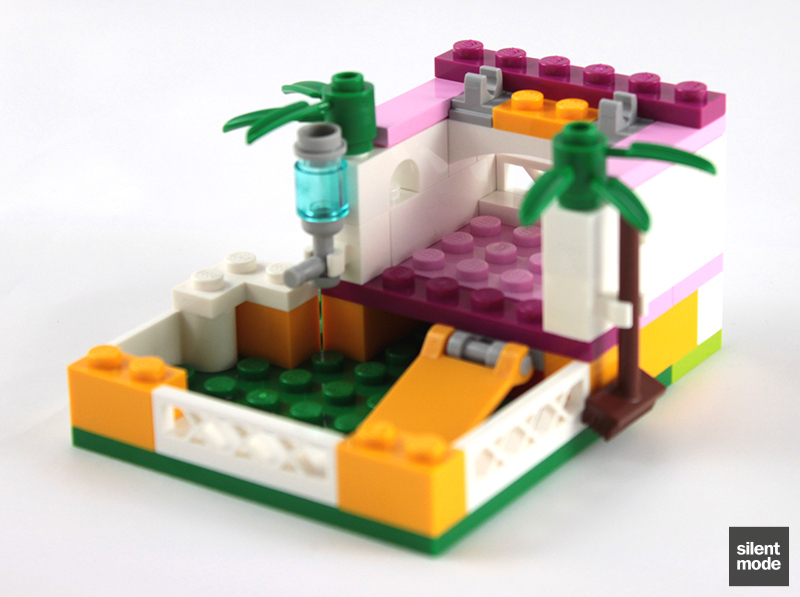 This first build, consisting of literally five parts, is of what LEGO calls a “garden”. At this point it’s a little disappointing, but more realistic I guess, that the red bucket doesn’t have a matching handle – or a silver handle might have been better. But there’s a useful technique with the Trans Light Blue round plate: no more imaginary water. 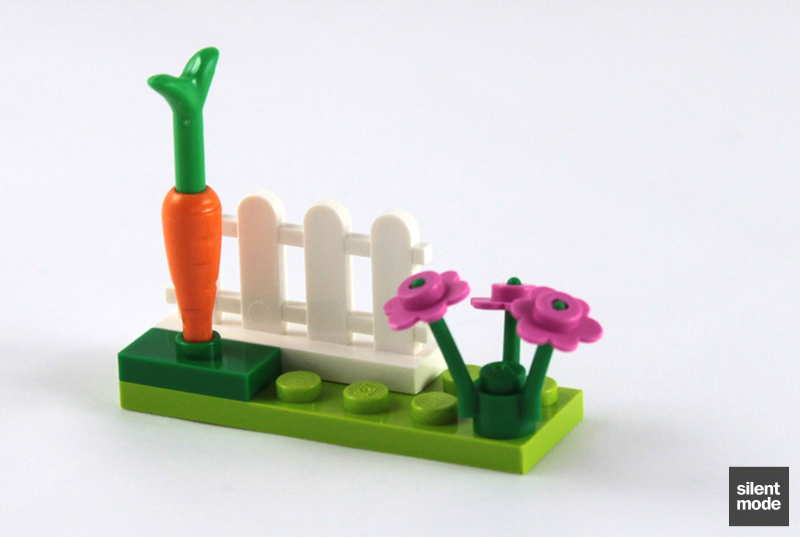 This equally small garden uses seven parts. Much like Stephanie’s Pet Patrol there’s a carrot sticking straight up out of the ground… it’s no ordinary carrot! This is a very simple build, using familiar techniques but with a couple of tricks for effect. Starting with the foundation, the Bright Light Orange flag forms a ramp (not a door as I’d previously thought). The multi-coloured walls of the house are slowly added, along with an easy-access gate on the left. The arch bricks form windows on the sides and back, giving the house a slight Spanish/Mediterranean look. A simple rodent water bottle is constructed from three pieces, before being added to the house along with a broom. The broom takes some effort to attach in the direction shown in the instructions. …the roof, which – thanks to the bamboo parts – forms a gentle slope upwards. This mimics what’s in the instructions, but of course you can set it up however you want. It looks just as small as the similarly-priced sets in the first wave, but it looks pretty good. Including the extra flower petals there are five spare parts, all with varying degrees of usefulness. They’re okay, I guess. 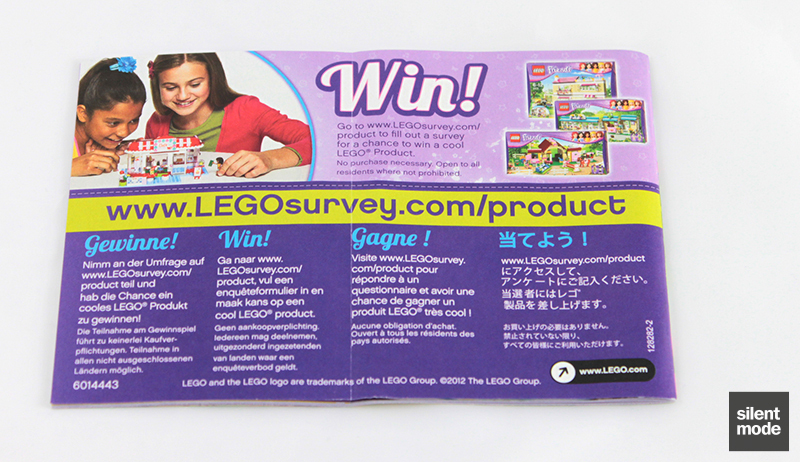 The end of the instructions points you to the LEGO Friends web site, after which follows a small check-list of sets. It’s probably more sensible to compare Andrea’s Bunny House to Stephanie’s Pet Patrol: both at the same price point and both featuring the same bunny mould, even if they are named differently. 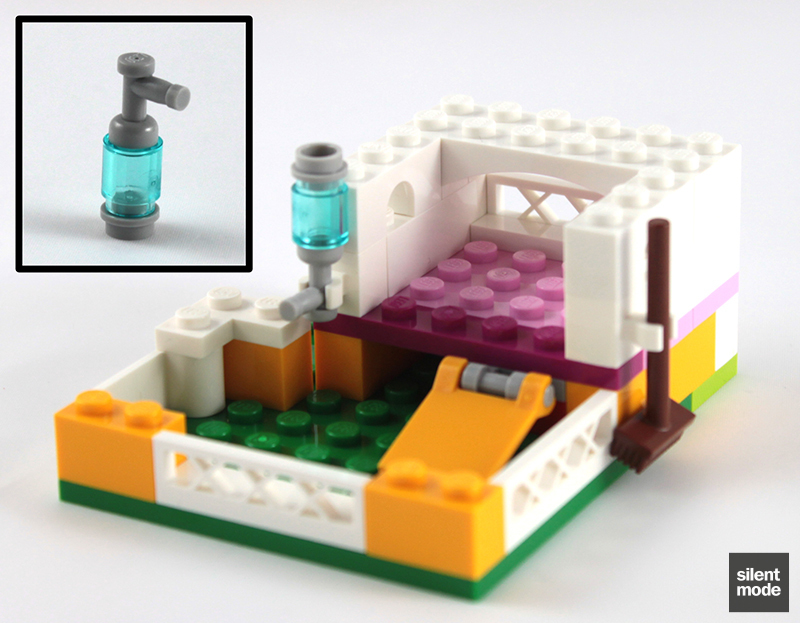 Both from a parts and build perspective, even with the tiny “gardens”, the Bunny House gives Pet Patrol the kind of scrubbing Stephanie was subjected to in a previous review. (In plain English: I would recommend this set over Stephanie’s Pet Patrol.) 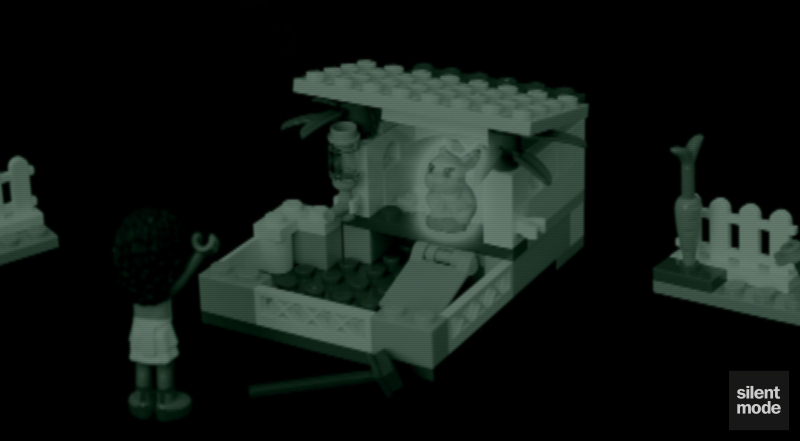 In comparison to Andrea’s Stage, which is set in a completely different environment, I think the Bunny House is a more complete and aesthetically pleasing set, although both have exclusive parts. 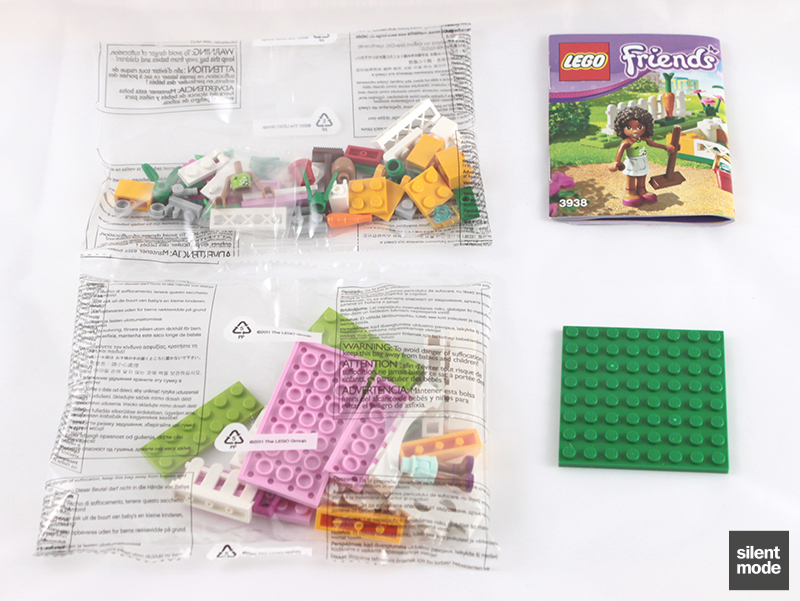 Although this set has less parts than both Stephanie’s Pet Patrol and Andrea’s Stage, I think this set has more of the useful parts for MOCs. On its own this set is a must buy for parts, discounted or not, as well as for Andrea. If you switched some of the white parts used for the Bunny House to Tan, it would make a good accompaniment to Olivia’s House. It would have been great to have Andrea in a slightly different outfit, and perhaps a different coloured bunny to distinguish it from Daisy (in Stephanie’s Pet Patrol). If Paradisa had a bunny house this would be it. An effective design with a small part count. A five-minute build, if that. Perhaps one small garden instead of two tiny ones would have sufficed. A must-buy for Bright Light Orange, the 8x8 Green plate, Magenta plates and whatever else takes your fancy. Fairly playable on its own, with just Andrea and the bunny, but more suited as part of a larger setup. Much less painful to buy than Stephanie's Pet Patrol for a similar kind of set, and worth it if you're after the four BFF stickers. Based on these scores I’m giving this set a straight 8.0. Stay tuned for more second wave Friends reviews. Daisy: Aaaaannnndreaaaaaa… I thought you looooooooved me…..